Mercedes driver Nico Rosberg cruised to victory ahead of Red Bull's Daniel Ricciardo in an incident-packed Belgian Grand Prix at Spa, but team-mate Lewis Hamilton was able to steer clear of the chaos to take third place and preserve his championship lead. 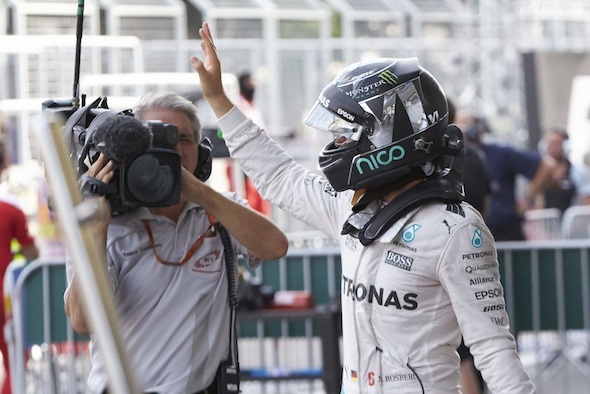 Rosberg, who had lost the lead from pole position at the last two races, made a good getaway and was able to streak clear at the front while Max Verstappen, Kimi Raikkonen and Sebastian Vettel all came to blows and were forced into an early pit-stop. Although a safety car and the subsequent red flag following a massive shunt for Kevin Magnussen at the summit of Eau Rouge wiped out the German's lead, he was largely unchallenged en route to a first victory since the European Grand Prix in June. Ricciardo capitalised on his rivals' issues to climb to 2nd but was unable to battle Rosberg as anticipated, while Hamilton made up ground amid the early carnage and managed to limit the damage in third. 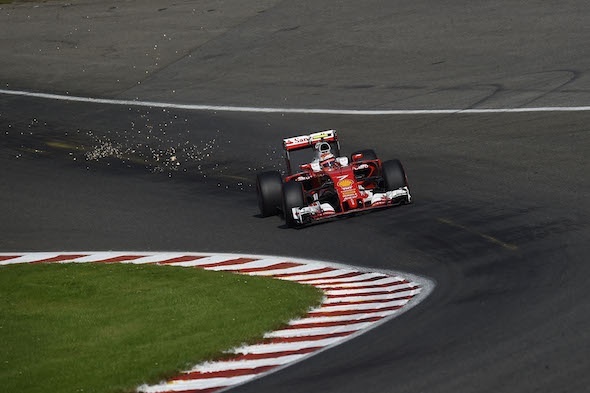 The Briton, who started 21st, was up to fifth when the aforementioned red flag brought a temporary halt to proceedings, and was able to dispatch Fernando Alonso and Nico Hulkenberg with relative ease and secure a podium which ensures he heads to Monza leading the championship by nine points. A first rostrum remains elusive for Hulkenberg, who nevertheless picked up 12 points in an impressive fourth place, while Sergio Perez took fifth to promote Force India to P4 in the constructors' standings ahead of Williams. Sebastian Vettel, left facing the wrong way at La Source following contact with Raikkonen, fought back to take sixth place ahead of Fernando Alonso, who was propelled up the running order in the frantic opening laps and held on under-pressure in the final stages to collect six points for McLaren. Valtteri Bottas came home eighth, while compatriot Raikkonen was forced to settle for ninth after a scruffy afternoon, having found himself a lap down following a lengthy, and somewhat fiery, pit-stop at the beginning of the race. The aforementioned safety car brought the then lapped Finn, who twice made contact with local hero Verstappen, back into play, and he made good progress through the field to claim four points. Felipe Massa completed the points but Verstappen will leave Spa empty-handed, even after a spirited fight-back and some typically controversial defending, which roused complaints over the radio from Raikkonen. There were no points for Haas F1 as Esteban Gutierrez and Romain Grosjean took 12th and 13th respectively, ahead of Daniil Kvyat and Jolyon Palmer, who was running in the points initially before falling back through the pack. Debutant Esteban Ocon was 16th, while Sauber's Felipe Nasr, penalised midway through the race for exceeding track limits, was the last classified finisher. Magnussen escaped with a minor ankle injury after the enormous accident on the exit of Raidillon, having lost the rear of his Renault and spun into the tyre wall, damaging the barrier so greatly that the race was suspended whilst the marshals repaired it. Marcus Ericsson started from the pit-lane but retired early on, joining Carlos Sainz, who suffered a spectacular tyre blowout on the Kemmel Straight, Jenson Button and Pascal Wehrlein, who collided at Les Combes, on the sidelines.